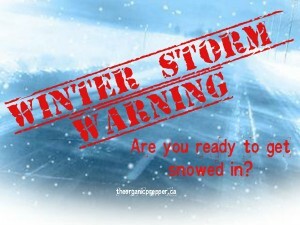 Home Editorials Winter Storm Warning: Are You Ready to Get Snowed In? If you’ve been watching the news, you’re well aware that a winter storm is bearing down on most of the United States. We’ve been warned of plummeting temperatures, ice, and lots of snow, even in places that don’t normally receive such weather. Are you ready to be snowed in for a few days? If not, there’s no time like the present to get prepared. Once you see how well you fare during the upcoming storm, you’ll be hooked on the feeling of security that you get from planning ahead. This article is written with those who are new to preparedness in mind, so for the more experienced readers, please chime in with your tips in the comments section! Keep in mind that with the holidays approaching, you could get snowed in with extra guests. Be sure you have enough supplies to keep everyone fed, hydrated, and warm. Often, heavy snow, high winds, and ice can take down power lines and it can take a couple of weeks to get it restored, so plan for a two week emergency. What would you need if the power went out and you couldn’t leave your home for 14 days? Once you begin creating your plan, you may be surprised to discover that you already have most of what you need to batten down the hatches for a couple of weeks. It’s just a matter of organizing it so you can see what you need. Use the following information to create your personal 2 week preparedness plan. Modify the suggestions to adapt them to your particular home, family, and climate. Everyone knows that clean drinking water is something you can’t live without. In the event of a blizzard and power outage, the water may not run from the taps. The pipes could freeze, or, in the event of grid failure, an electrically driven pump will not work. The need for heat is a given in the midst of a winter storm. During the first 24 hours after a power outage, you can stay fairly warm if you block off one room of the house for everyone to group together in. Keep the door closed and keep a towel or blanket folded along the bottom of the door to conserve warmth. You can safely burn a couple of candles also, and in the enclosed space, your body heat will keep it relatively warm. As well, dress in layers and keep everything covered – wear a hat, gloves (fingerless ones allow you to still function), and a scarf. However, after about 48 hours, that’s not going to be enough in very cold weather. You will require back-up heat at this point. If you are lucky enough to have a source of heat like a fireplace or woodstove, you’ll be just fine as long as you have a supply of dry, seasoned firewood. A common cause of illness, and even death, during a down-grid situation is lack of sanitation. We’ve discussed the importance of clean drinking water, but you won’t want to use your drinking water to keep things clean or to flush the toilet. If the pipes are frozen or you have no running water for other reasons during a winter storm, you’ll need to consider sanitation needs. Look at your options for sanitation. Does your toilet still flush when the electricity is out? Many people discovered the hard way that the toilets didn’t work when the sewage backed up in the highrises in New York City in the aftermath of Hurricane Sandy. At our old cabin, the toilet wouldn’t flush without power because the pump was electric. If you are on a septic system, with no risk of the toilet backing up into the house, simply store some water for flushing in the bathroom. At the first sign of a storm, fill the bathtub for this purpose. Add the water to the tank so that you can flush. In the event of a winter storm, you’ll need some special supplies in order to keep walkways and steps clear and less hazardous. Exercise that you’re unaccustomed to is one of the most frequent causes of death in the aftermath of a snow storm. Many people drop dead of a heart attack shoveling their driveways. If you aren’t in shape, be sure that you use good sense when performing strenuous tasks. Take frequent breaks, stop when your out of breath, and do only a little bit at a time. Be sure also to dress appropriately for the weather. Don’t feel like you are crossing over to the tinfoil hat side by preparing for all eventualities during a winter storm. This doesn’t mean you’re loading your car with gas masks and decontamination suits. It doesn’t mean your house is stacked to the rafters with ammo and body armor. It’s just plain old-fashioned common sense to keep a naturally occurring event from becoming a crisis. It’s far better to have your supplies and never need them than to need them and not have them. As for us, we can’t wait to have a snowball fight and make cocoa on the woodstove! Bring it on, Mother Nature!